My father-in-law's birthday is coming right up and my clever Sister-in-Law is organizing a fun 70th Birthday Book for him with pics of memories with him, quotes from the grandkids, kids and of course a "Fountain of All Knowledge" section because before Google, there was Bert. I remember my hubby talking about his dad, he said his dad always knew the answers to everything. He went to his dad with all questions! That's amazing because we didn't have Google back then. LOL Can you even imagine that? To this day the Hubs still asks his dad for advice. What a great thing to teach your child! Reminds me of Nephi and his father Lehi (in The Book of Mormon) Nephi believed all that his father said. My father-in-law even taught my Hubs that it's ok not to know everything, the act-as-if principal, or just fake it till you make it. Basically, nothing is beyond our capacity to learn if we desire to do so. Wise advice because my Hubs now is an entrepreneur, runs his own videography business thanks to that principal right there (it's a skill all entrepreneurs need, the ability and willingness to learn) and of course he says he can do things, even if he's not 100% sure of how, because he will just learn how to do it ASAP. His business started with a responsibility to do something he didn't previously know how to do. My Hubs is the best researcher I know, if he doesn't know how, he will figure it out and be the expert at it and even be able to answer questions about it. But don't worry you won't see his researcher side, you'll just see his dad's side, the "Fountain of all Knowledge" side. ;) LOL Can you tell he's my fave? So, I was given the assignment to ask my kids some questions which would spark memories of Grandpa for my boys. I didn't really have any questions to start with so I, of course, went to Google, because I can't ask Bert, this is for him remember. ;) And since I was going to do it anyways, you know I had to design this fun printable for everyone else who may need it out there. Not the standard ones, based on the questions found in this post too. 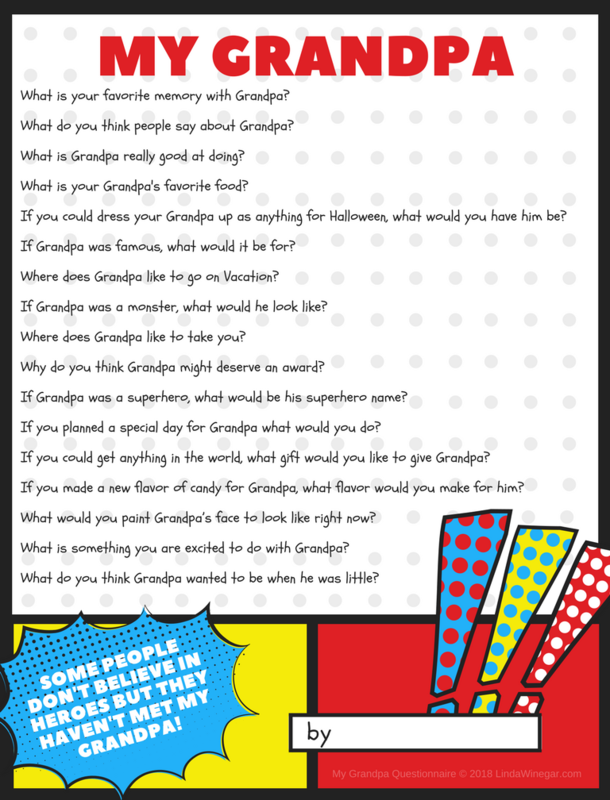 Here are the questions with the answers from my sweet little 4yr old, also since he thinks his Grandpa is a superhero, figured he wasn't the only one. All Grandpa's are heroes! What is your favorite memory with grandpa? What do you think that people say about Grandpa? What is Grandpa really good at doing? What is a cool new nickname that you think everyone should call Grandpa? If you could dress your Grandpa up as anything for Halloween, what would you have him be? If Grandpa was famous, what would it be for? Where does Grandpa like to go on Vacation? If Grandpa was a monster, what would he look like? If you could make any wish for your Grandpa, what would you wish for him? Why do think Grandpa might deserve an award? If Grandpa was a superhero, what would be his superhero name? If you planned a special day for Grandpa what would you do? If you could get anything in the world, what gift would you like to give Grandpa? What would you paint Grandpa’s face to look like right now? If you made a new flavor of candy for Grandpa, what flavor would you make for him? What is something you are excited to do with Grandpa? What do you think Grandpa wanted to be when he was little? I might have tweaked the questions a bit when I made it for everyone else. So grateful for Grandpa Bert, because he helped to raise the man of my dreams and the man who my boys adore and want to be. You are an inspiration, we love you Bert, Happy 70th Birthday! Now off to go and get my 9yr old to give me some cute answers for this memory book too.